A flexible miniature mold especially made for air dry clay. 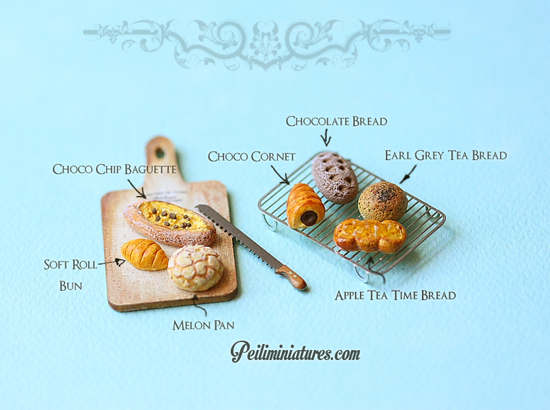 Make delicious realistic looking 1/12 scale dollhouse miniature assorted breads! You can make 7 different assorted breads with this Mold. Build your own dollhouse miniature bakery with this! This mold is flexible enough for you to remove the clay out from the mold even when the clay is not dried. Please note that this mold is designed to last you a very long time IF you use it correctly. You can bend lightly to release clay from the mold. For best results, wait till the clay is dry to remove it. For Polymer clay users, please do not bake the mold in the oven to prevent mold from losing its durability. Recommended clay to use includes Hearty Clay, Grace Clay, Cosmos Clay, Resix Clay, Daiso Soft Clay, Pando Clay. Mold measures 5.5cm by 4cm. They are perfect as dollhouse miniature food, as you can see based on photo with other accessories. This listing is for the MOLD only. Breads and accessories are NOT included in the purchase.